Rome Life in Ancient Rome - HISTORY'S HISTORIESYou are history. We are the future. The ancient Romans were one of the most advanced civilizations in history. At its peak, the Roman Empire stretched across Europe, North Africa and Asia and was home to more than 45 million people. At the Empire’s center was Rome. Rome was one of the largest and most carefully planned cities in the ancient world. It had gleaming white marble temples and palaces. It had a public square called the Forum where Romans shopped, conducted business, played games, and visited with friends. Wealthier Romans lived in big houses built around courtyards. ​With more than one million people living there, the city was also a dirty and dangerous place, with a maze of side-streets and slums. Most Romans, were poor and performed unskilled labor for work. In contrast to the opulent homes on Palatine Hill, the working poor of Rome crowded into the ancient equivalent of apartment buildings. Their neighborhoods were noisy, and dirty. Politicians offered free food and entertainment to gain the support of the poor. People watched chariot races, as well as gladiator fights. Gladiators fought each other. Sometimes, they even fought wild animals to entertain the crowds. Rome grew into an empire, in part, because of how it treated the people it conquered. After adding a new territory to the Empire, Rome extended the rights of citizenship to the people they conquered. The Roman Empire expanded through the use of force, it’s true. Once the new people became citizens, however, they were Roman, no matter where they called home. One way that Rome controlled newly conquered populations and bound people to Rome was by building “Roman” towns throughout their Empire. In doing so, they also extended a distinctly Roman “way of life.” In this lesson, you will find out what it was like to be Roman. How did the Roman government act like the head of a family? When we think of a family, we understand it to be mother, father, and children. The Roman familas was large and its definition was broader. Really, it was anyone who was “familiar” to one another. The Roman family included the parents and children, as well as the sons’ wives and their families. The Roman family could even include slaves. If a Roman man had no sons, it was common practice to adopt adult males into the family to ensure an heir. When a daughter married, she passed into the household of her husband. What legal rights did Roman women have? Roman mothers were called materfamilias. The wife of paterfamilias often shared power with her husband. She ran the household, controlled the money, and raised the children. She may not have had many legal rights, but she enjoyed enormous respect and prestige in the home and in society. Unlike a wife in ancient Athens, a Roman wife could leave her home to visit with friends and to attend the games, the theater, and the courts with her husband. In the streets, a path was cleared for her, and anyone who insulted her was deemed worthy of death. In society, the materfamilias was honored. Materfamilias from wealthier, more powerful families had more freedom than those with less money. They could own property and run their own businesses. They could hire slaves to do their housework. That way, they had free time to study art and literature and to go out for entertainment. Women with little money generally worked in the family business and took care of their households. Sons were highly valued because they kept the family name alive and brought money into the household. Generally, they were expected to follow in the footsteps of their fathers. If your father worked in politics, you were expected to become a politician. If he was a slave, you would also be a slave. Daughters could increase her family's status and influence within society by marrying an important man. Slaves were considered part of the family. The use of slaves in Rome became more common as the empire grew larger. Most enslaved people were prisoners of war. They worked in homes and on farms. They also helped build roads, bridges, and buildings. While some were treated poorly, because they did essential work and were ¨family,¨ they were more often treated with kindness. We don’t know as much about Roman children as we do about Roman adults. But the Romans liked to write about how children were supposed to behave, instead of how they actually did! Who Went to School in Roman Times? Surprisingly, very few children actually went to school in ancient Roman times. For most, the education of the children was in the hands of the family. A mother taught her daughter how to manage the household - how to prepare and cook food, and how to make the family's clothes. A father taught his sons the practical necessities of life - reading, writing, arithmetic, and the laws. It was also the father's job to teach his boys proper conduct, the qualities of virtus [virtue], dignitas [dignity], and gravitas [seriousness]. Included in a son’s lessons was how to show respect for Roman custom, for tradition, for the gods, and for authority. 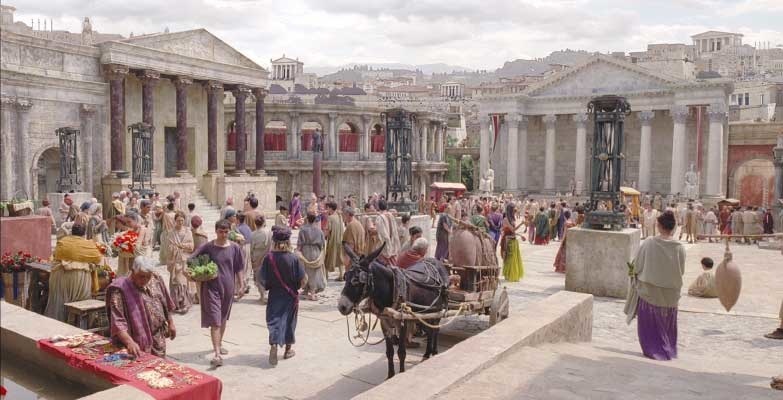 Romans revered Roman laws and traditions and they honored those in authority, whether the authority was embodied by the paterfamilias or the magistrates. Roman boys learned how to obey before they grew up to command. And as an adult, a boy's public conduct was expected to demonstrate the same virtues he used to govern his household. What skill was considered most important for a job in government, law, or the military? Primary: This was attended by lower class boys and girls between 7 and 14 years of age. At this level, teachers were called Litterators. A primary education consisted of learning how to read and doing basic arithmetic. The school day started early and if you did not achieve what was expected of you beatings were common. Tertiary: Rich children might have continued their education. If they did, they were taught by a Rhetor from whom they learned the art of speaking and writing. Very few students went on to study rhetoric. At this stage, students had to learn how to put forward an argument and be confident in speaking publicly. Those skills were important for a future job in government, in law, or as a commanding officer in the army. Children learned to write using wax tablets (thin pieces of wood coated in beeswax - example shown at left). The wax was very soft and children scratched into it with a bronze stylus. If any mistakes were made, the flat end of the stylus could smooth the wax out. Boys studying at a higher level learned to write on papyrus (“paper” made from reeds). This was done using a quill with a split nib which could be dipped into ink pots. Ink was made from vegetable dyes, soot and sepia from cuttle-fish. 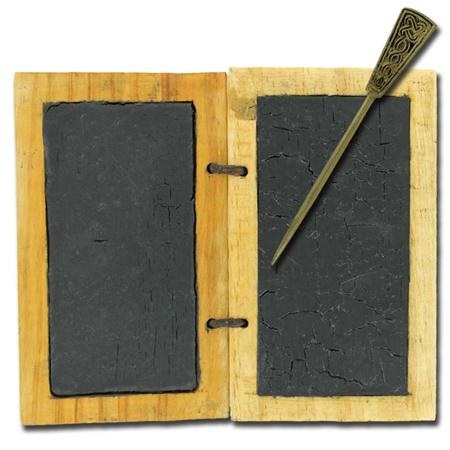 Because papyrus was expensive, Romans used re-usable wax tablets for all types of writing. CLICK the picture above to learn more about a recent discovery of Roman wax tablets in London. Roman children wore pendants called bullas, from the Latin word for "bubble," around their necks. The wealthy wore bullas made of gold. A typical plebeian bulla was leather. While most Romans worked very hard for long hours each day, they also valued entertainment in all forms, including game. Ball Games: Sports were a favorite activity of ancient Romans. While Romans did not play football, they did play ball games. The balls were made of leather that were stuffed with horsehair, so they were very heavy and did not bounce. Consequently, ball games usually involved throwing or catching. The fresco at right depicts Roman women playing with a kind of medicine ball called a paganica. One game played was called trigon. When playing trigon, three players would stand in a triangle throwing balls to each other. Sculpture showing girls playing knucklebones. Nuts: Nuts were used like marbles are today. They were also used to play a game called ‘par impar’ (odd or even). In this game, a child held some nuts hidden in their hand (or behind their back) and their opponent had to guess if they were holding an odd or an even number of nuts. ​Knucklebones: The bones of sheep or pigs were used to play Knucklebones. The bones were thrown into the air and the players had to catch as many as they could on the back of their hands. Roman Toys: Roman children played with a variety of toys. They included things such as rattles made from wood or bone, trolleys with wheels to help them learn to walk, dolls, made from cloth and wax, animals made from wood or clay (or bronze if your family was rich), and toy chariots. Some of these had sails and some were pulled by mice! Most of the clothing worn in Ancient Rome was made of wool. Wool cloth was made throughout Italy. Less wealthy Romans might have woven cloth at home. In addition to wool, wealthier families might have had clothing made from Egyptian linen, Indian cotton, or Chinese silk. For a time, silk was so popular - and so expensive - that the Roman Senate worried the silk trade would bankrupt Rome. 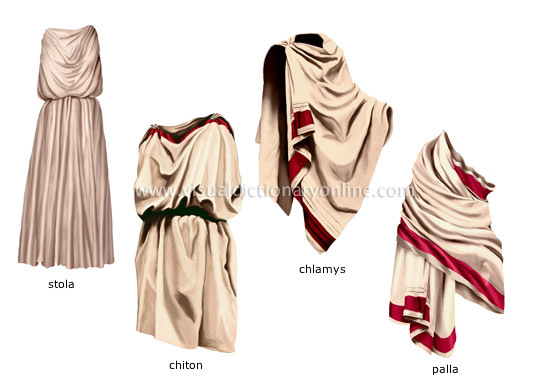 How did Roman males use their clothing to indicate their social status? Togas were usually white or off-white. However, wealthy young boys and senators wore a toga with a purple stripe to show their status. A wider stripe indicated higher status. Women wore white clothing until they were married. After marriage, they wore a variety of colors. The most common form of clothing for women was the tunic. Higher class women wore under-tunics called stola which had short sleeves and were fastened with a brooch called a fibula. A long robe called a palla was worn tightly over the top. Sometimes this was so tight that women couldn’t use their arms! Poor men wore a loincloth and a simple tunic fastened with a belt. These tunics were usually made from two pieces of wool cloth sewn at the shoulder. A rough wool cloak was also worn if it was cold. Fourteen-year-old boys were allowed to wear pure white togas called ‘toga virilis’. What shoes did Romans have? Poor people wore laced up sandals made from leather or wood. Outside of the house, richer Romans wore leather boots held on by thongs. They wore lighter, more comfortable, sandals in private. Senators wore sandals with small crescents on them to show their status and rank. Rich women wore a lot of jewelry. Most jewelry would have been made out of bronze or sometimes glass. More valued items were made from gold and precious stones such as emeralds, rubies, pearls, and amber gathered from across the Empire. Popular pieces of jewelry included finger-rings, earrings, bangles and brooches. Roman men usually had short hair. As the Empire expanded, however, some men took on styles they encountered elsewhere. For a time, beards were popular. Just like some fans copy the fashions of celebrities today, in ancient Rome some men showed their loyalty by copying the way the Emperor wore his hair. Roman Emperor Nero had long hair at the back with sideburns, but Hadrian grew a beard to show his admiration of the famous Greek scholars. Oil mixed with earthworm ashes to stop hair going grey. Lentils, wine and cypress leaves boiled with leeks to dye hair black. Bear fat or the ashes from hippopotamus skin to make hair grow. Bats’ blood and hedgehog ashes to remove hair. Slaves called ornatrices would help wealthy women get dressed and apply make-up. To soften skin, cream made from wheat flour and donkey’s milk, or crushed snails was applied. Because women from lower class backgrounds often worked harder, exposed to the elements, pale skin was taken as a sign of status. Ancient Roman women used skin whitener made from lead paste or powdered chalk. Rosy cheeks and red lips were created using red ochre or leftover wine. Crushed ants’ eggs or ash were used to highlight eyebrows. Eyeliner was made from soot. The ancient Romans did not know about many of the things that we eat now. Things like potatoes, corn, and tomatoes came from the Americas. That’s right, no tomatoes means means no “red sauce” for their pasta. Off course, the Romans did not have pasta at meal time either. Pasta was a Chinese invention that likely did not come to Rome until the 14th century. Instead, the Romans ate foods such as bread, olives, olive oil and cheese (from sheep or goats’ milk). How well you ate in Roman times depended great deal on how wealthy you were. Richer Romans ate huge meals with elaborate dishes but ordinary people ate simpler foods. A Roman breakfast was taken early and was usually simple. It included light fare like water, bread, and honey. For lunch, a Roman might sit down to a spread of bread, cheese, eggs, salad, and fruit. People drank red and white wine, mixed with water. Snacks throughout the day might include handfuls of hard olives and nuts. Things really picked up for dinner. Dinner was the main meal of the day. If you were a wealthy Roman, your dinner likely had several courses. Starters could be shellfish, sliced eggs and salad. This was followed by a meat dish (pork, chicken, hare, peacock, fish, lamb etc). Dessert could be fruit, nuts, honey or cake. Poor people in ancient Roman times received free bread from the state so this formed an important part of their diet. They did not have kitchens in their homes, so they often bought food from thermopolia (bars) in the streets or markets of their town. Their diet included lots of bread, beans, lentils, and porridge made from ground wheat and water. The poor ate very little meat or fish. Rich people ate very well. It was not unusual for wealthy households in ancient Rome to have huge feasts at dinner time. More than just a meal, those feasts were events. Dinner for the wealthy included several food courses and entertainment and could last for hours. At such meals, guests could eat so much they made themselves sick. Upper class homes even had a special room called a vomitorium for that reason! The dining room (or triclinium) often had three reclining couches for guests to sit on - or lay down on - while they were eating. The couches were arranged around a rectangular area where a small table stood. Guests sat in threes according to their social status. In patrician homes, entertainment was often on the menu. Before eating, a small bowl of food was placed in front of the statue of the family God as an offering. Romans would then have their slaves wash and dry the feet of any guests. The ancient Romans loved to “wow” their guests and liked to disguise the food they served. The look of food was as important as taste and often herbs, spices and sauces were used to disguise the taste of things. New spices were introduced as the Empire expanded. Mealtimes often lasted several hours. Between courses, dinner guests were often entertained by musicians, dancers, clowns or poets. Wealthy Romans enjoyed many foods that we might find unusual. They liked to eat birds such as thrush, jackdaws, ravens, swans, coots, crows and even peacocks. For a time, a favorite dish for the wealthy was flamingo stuffed with peppercorns. They rarely wasted anything, eating even the lungs, brains, tongues, and intestines of the animals! A popular dish in wealthy households was dormice! The very rich kept dormice and fed them walnuts, acorns, and chestnuts to make them fat. They would then kill the mice and stuff them with sausage meat, or coat them with honey and roll them in poppy seeds before cooking and eating them. Snails were also fattened by feeding them milk and then fried. For vegetables, the Romans ate peas and lentils, but they also liked dandelion leaves, nettles and seaweed. Ancient Romans usually drank water or wine. Wine was mixed with water. The very rich also mixed it with spices and heated it. Poor Romans drank posca. Posca was made by watering down acetum, which was a low quality wine similar to vinegar. Beer and mead were also drunk in some areas. Milk from sheep and goats was not drunk but was used for cheese and medicines instead. How did Romans acquire their slaves? The ancient Romans worked at a variety of jobs. Most Roman slaves were kidnapped from their villages all over Europe, Africa, and the Middle East. Others were prisoners of war, captured by the Roman army. Slaves performed a variety of tasks in ancient Rome. Wealthy Romans bought them in the local slave markets and they might have had between 100 and 10,000 slaves working in their town houses and country villas. Most slaves cooked, served food, cleaned and washed, but some might have been tutors (if they had been educated themselves). Slaves had no rights and they could be punished or killed by their masters. They could only become free by buying their freedom (if their masters paid them pocket money for their service) or as a gift from their masters. The Senate governed Rome and there were different levels of responsibility. Consuls led the army, Aediles were in charge of public work, and tribunes looked after ordinary people’s interests. At first, senators were chosen by Rome’s leaders, the consuls. By 300 CE, however, Roman Emperors usually chose the senate from among their own friends. Roman towns had their own governments and local politicians would campaign, just like they do now, by giving speeches in the Forum. Politics in ancient Rome could be a bloody affair. It was not unusual for a politician to make up lies about their opponents’ personal lives or even to murder them. 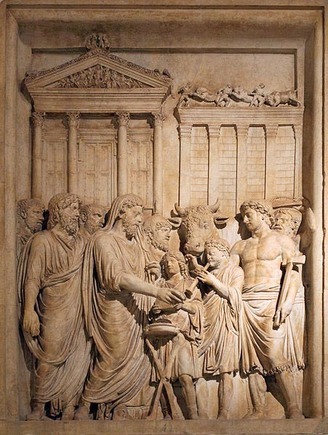 Roman doctors based their treatment of the sick on common sense, superstition, and by remembering what had worked in the past. Many of their medicines were plant based. For instance, poppy seed juice was given to crying babies and bark from a willow tree was used to lower fever. Many Roman doctors believed sanitation was important in keeping people healthy and insisted that aqueducts be built to bring fresh water into towns and that water from muddy streams be filtered. Because there were not many hospitals, most sick people would go to temples dedicated to the god of healing. Educated Romans loved reading, and much of what we know about the Roman culture comes from the work of professional writers. These writers included poets, historians, and scientists. Books had to be hand written because printing had not yet been invented. Sheets of Papyrus were glued together to make a long scroll that was wound onto wooden rods. Books were copied onto these scrolls by slaves. What duties did Roman priests perform? Religion was very important in ancient Rome. Romans worshiped Gods and household spirits. A Roman priest was called a Pontifex. Their duties included looking after the temples and making sacrifices of bulls, sheep and pigs to the gods. They also carried out ceremonies in which they burnt incense and said prayers. The high priest was called the Pontifex Maximus. Special priests called augurs looked into the future, using signs in nature to predict events! Although priests were men, a girl from a good family could become a Vestal Priestess. They watched over the fire in the Temple of Vesta making sure it kept burning. This was a very important job as the fire was a symbol of family life and civilization. Why did Roman farmers rotate their crops? Although oxen were used to plow the fields, farming was hard work and was mostly done by hand. A farmer's tools included spades, hoes, wooden rakes and sickles, and scythes for cutting wheat. If farmers grew wheat in a field one year, they would grow peas and beans in the field the next year. Roman farmers knew that by rotating their crops each year they would keep their soil fertile. Farmers also bred cattle and sheep for meat and milk, as well as for their skins. Fishermen went out on small boats to catch fish, octopuses, crabs, lobsters and other sea animals. Fishermen often went fishing at night, bringing home their catch in the morning and selling it fresh on the markets. Seaside towns like Pompeii always had fresh fish for sale. Fish were caught with three-pronged spears, basket traps and nets. Sailors sailed the coastline between ports delivering cargo. Trading was an important part of Roman society. ​Where did most poor Romans live? Life in an insula was a cramped, noisy affair. The word, domicile, comes from the Latin words domus, meaning 'house,' and colas, which means 'dweller.' Words such as 'domestic' and 'colony' share those Latin roots. Today, we simply think of a domicile as a house. 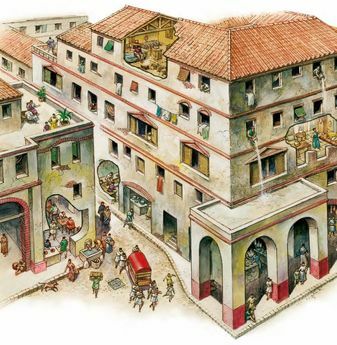 Very poor Romans lived in cramped apartment buildings known as insulae. These buildings were usually three to five stories high. The poorest people lived at the top. Individual apartments were no more than one or two rooms. Because most poor Romans spent their day working, they only used these dwellings to sleep in. The apartments lacked kitchens and running water. 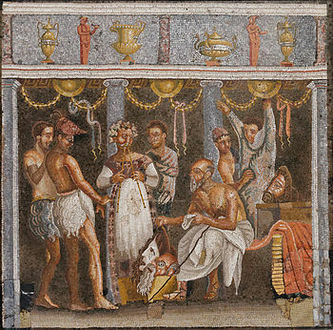 As a result, poor Romans often bought and ate their food at taverns, bathed at the public baths and used public toilets. Water had to be collected from a public water fountain and carried home. A villa provided a home life only the wealthy could afford. The rooms in a Roman house were grandly decorated with colored plaster wall paintings called frescoes and with mosaics. The mosaics were a demonstration of how wealthy you were! They often had historical themes or showed scenes from daily life. Woven reed or wool rugs were put down on the floor to add comfort. The Romans preferred their houses to be uncluttered. As a result, most Roman homes had very little furniture. Stools were used instead of chairs, and reclining couches were used to sit and to eat on. Tables were made from rare woods, marble or silver. Beds had leather straps instead of springs. Curtains hung across doorways but were not used in windows like they are today. The windows of a Roman house usually faced inwards so Romans could see their garden rather than the the busy streets outside. Windows didn’t usually have glass in them but used wooden shutters instead. Oil lamps were used to generate light. Olive oil was put into a jar made of metal or of pottery and a wool wick was added and lit. Wealthy families could afford central heating (known as a hypocaust), which usually kept the dining room and baths comfortably warm. The furnace in a wealthy Roman's home was outside, below ground level, and slaves used firewood to keep it lit. The floor of the house was held up on a pillar of tiles or stone, so that the hot air and smoke could circulate below the rooms. The heat traveled through hollow tiles in the wall escaping into the brickwork and keeping rooms cozy and warm. Rich Romans could afford to have water piped to their homes. These pipes were taxed – the larger the pipe, the more tax a person paid. The Forum was the center of daily life in every Roman town. The Romans built new towns wherever they went. They were usually built in regular blocks and had temples, bakeries, food stores, bars, and public bathhouses. The streets would have been very busy, dirty, and often flooded. What role did the Forum serve in Roman towns? Curia: This was where the town’s council meetings took place. Theater: Roman towns would have had a theater where plays were performed. Treasury: Where money belonging to the town was kept. Basilica: This was the town hall and law courts. Temples: The most important gods had large temples in town. In front of each large temple was an altar where citizens could make sacrifices to keep the gods happy. Amphitheatre: Romans loved the amphitheatre where they could watch gladiators fight. Tabularium: A place where all the town’s official documents - documents such as tax records - were kept. Romans were not shy about sharing the toilet. Apodyterium: This was the changing room where everyone would undress and leave their clothes on shelves. Theft was common, so richer visitors would hire an attendant or bring a slave with them to look after their clothes. Tepidarium: Romans could swim and bathe in this warm room. They did not have soap, so they covered their body in scented olive oil and scraped it off using a tool called a strigil. Frigidarium: They then visited the “cold room.” Romans believed visiting a hot then cold room was very good for their health as it got their hearts racing. Toilets: The baths had public toilets where Romans could sit and chat. These looked like wooden benches with holes in them. Instead of toilet paper, which the Romans did not have, they used a sponge on a stick to wipe their bottoms. What were three types of entertainment enjoyed by Romans? The Romans loved entertainment! Music, theater, and dance were all enjoyed. If you were a dinner guest in a patrician home, your host would likely schedule entertainment for your pleasure. Patrician or not, all over the Roman Empire, people gathered in amphitheaters to watch violent shows known as “the Games.” Lots of events were put on to entertain the audience. While the Colosseum is the most famous Roman amphitheater, across the Empire, a town of any size likely had their own. Left to right above are amphitheaters in Aspendos (Turkey) Arles (France) and Bosra (Syria). Most amphitheaters were built in three levels of columns and arches, standing one on top of the other. By using this method, the Romans could make them stronger and taller. They were decorated with painted statues of gods, goddesses, heroes, and emperors. They were large, beautiful and imposing buildings at the heart of Roman cities and showed off the Romans’ power and wealth. The seating in the amphitheater was divided into five separate blocks. Ringside Seats: These seats were only about 6 feet above the arena, were made from marble, and were reserved for senators. Second Block: Used by the equites (important people, usually descendants of army officers). Third Block: Reserved for wealthy merchants - the patricians. Fourth Block: These were kept for the poor people - the plebeians. This block was made up of wooden benches. Fifth Block: At the very top of the arena, these seats were reserved for the wives of senators and for slaves. Upper class women were not allowed to sit with men in the amphitheater. The Romans were master designers. Each section of seating had its own passageway leading to a different exit. This meant that even huge amphitheaters like the Colosseum, which could hold 50,000 spectators, could be emptied in 15 minutes. Chariot racing was staged in the hippodrome. In Rome, these races were watched by thousands of men and women in the Circus Maximus. Even larger than the Colosseum, the Circus Maximus was the largest of its kind. It was 600 meters long and could hold 250,000 spectators. That's more than 40% of the population of Seattle. Like amphitheaters, cities across the Empire also had hippodromes. At the hippodrome, the Romans supported their teams passionately and each team had its own horses, stables, trainers and grooms. It was taken very seriously and huge amounts of money were gambled on each race. Fights would sometimes break out among supporters, who could recognize their team by their colors (red, white, blue and green). The race was started by the magistrate who dropped a white flag called a mappa. This was the most dangerous point of the race because so many chariots and horses were close together. The charioteers used their body weight to help steer the chariot. If they made a small mistake, they could fall to their death. Each race was five miles long, lasting for seven laps. Laps were counted by removing large wooden eggs or turning model dolphins over. The winner of the race won prize money and a symbolic victory palm. Gladiator fights were considered the main event in amphitheaters throughout the Empire. Gladiators were usually slaves or criminals and they were trained in special schools to prepare them for fighting in the arena. They were owned by rich men who liked to bet on them (or against them). Women found the gladiators very attractive and the gladiators could win fame, glory and prizes. If a Gladiator fought well or survived long enough they could be set free. What purposes were served by the violence of the Roman games? Gladiators often fought in pairs or groups and were expected to fight to the death. If a gladiator was wounded, the emperor could spare their life. However, he would usually listen to the opinion of the crowd. Commonly, we think of “thumbs up” as signifying something good, while we think of thumbs down as signifying something bad. Movies have popularized the myth that those signs began as a way for the audience to signal pleasure or displeasure with a gladiator in ancient Rome. Instead, any show of the thumb - up, down, or sideways - was a call for the death of a gladiator. Displaying the thumb symbolized an unsheathed sword. If the crowd wished to spare a gladiator, they would tuck their thumb inside of a closed fist, a gesture symbolic of a sheathed sword. Gladiators were popular in Roman art, as well as in the arena. Gladiators were often treated as the movie stars of their age. Success bred popularity and popularity led to celebrity, status, and spectacle. A few days before the games, a program of events would be posted up all over town. The Romans were a bloodthirsty lot and got easily bored. Emperors spent huge amounts of money planning elaborate games. The arena was turned into mazes and sometimes flooded so that the gladiators could sail in small ships. They even used wild exotic animals, such as lions, bears, wolves and elephants, to add to the spectacle. Sometimes, unarmed prisoners and criminals would simply be herded in so the crowd could watch them being killed and eaten by animals. Violent as the games were, they served political, religious, historical, and social purposes. Politically, it was a way for the Emperor to demonstrate his authority and, with so many public deaths, his power. The deaths also reminded the Romans of the sacrifices that were necessary to please their gods. During gladiator fights, players dressed as the gods were even called upon to inspect the fallen and determine whether or not they were dead. Gladiatorial combat was not the only type of warfare that took place in Roman amphitheaters. In larger arenas, whole battalions of soldiers squared off against one another. Rome's Colosseum was even large enough to stage naval battles. Events like those reminded spectators that the greatness of the Roman Empire was based on conquest. Finally, in the same way that you might feel a bond with other fans when you watch your favorite sports team win a championship, the games provided both a psychological and social bond to the witnesses to the violence. The different types of gladiator each had their own weapon and skill, which allowed the crowd to pick them out. Samnites fought with a small sword and a long rectangular shield. They wore a helmet with a large crest, with one arm protector and one leg shield (called a greave). These gladiators wore a helmet crowned with a fish. They carried a large shield and wore one arm protector and a greave. These carried a square shield and fought with a curved sword. They wore high greaves, an arm protector and a wide-brimmed helmet. What types of plays were enjoyed by Roman theater-goers? Theaters were large, open air, semi-circular buildings with rows of tiered seats. The Romans copied a lot of their theater design and their dramatic forms from the ancient Greeks. Performances were put on as part of religious festivals and tickets were free. All of the actors were male and some of them even had their own fan clubs! The Romans preferred comedies to tragedies and the stories were usually about rich heiresses, foolish old men, and cunning slaves! Later, pantomimes with masked dancers and mimes based on mythological characters became very popular. The picture to the left is of a mosaic found in the remains of a theater in Pompeii. Theater costumes varied according to the type of play being performed. The actors often wore masks so that they could play more than one part. Comic masks had large, grinning faces and tragic masks had sad, gaping mouths. Sometimes small stages (made from planks of wood) were used on the streets and, much like today's buskers, performances were given. In these street performances, women actors were allowed! Early Romans practiced a religion that was polytheistic. That means they believed in lots and lots of gods. During the Roman Empire, hundreds of gods and goddesses were worshiped. Roman gods and goddesses were like people but they had magical powers and each of them looked after different groups of people or things. As the Roman Empire expanded, Romans adopted many of the gods of the peoples that they conquered. They especially liked the Greek gods, adopting them for their own uses and giving them Latin names. Jupiter was the god of the sky and also king of the gods. His symbols are the eagle and thunderbolt. 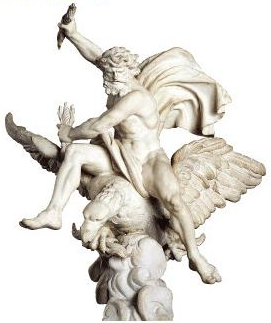 He is pictured above riding and eagle and with a thunderbolt in his hand. Juno was the wife of Jupiter and patron goddess of women. Her symbols were geese, peacocks and wild fig trees. Neptune was god of the sea and was Jupiter’s brother. His symbol was the trident. Venus was the goddess of love and beauty. 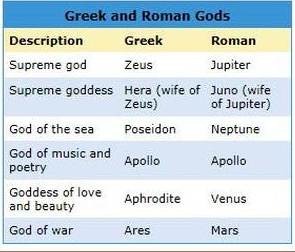 Mars was the god of war. Other than Jupiter, he was the strongest and most feared god. Minerva was the goddess of wisdom and women’s work (e.g. weaving). Her symbol was the owl. Mercury was the gods’ messenger. The wings on his helmet and sandals allowed him to travel the skies quickly. He was god of travelers and tradesmen. Jupiter, Neptune, and Pluto were the three sons of Saturn. They divided the world up, so that Jupiter looked after the air, Neptune had the sea, and Pluto ruled the Underworld, the home of the Dead. Pluto was the god of the Dead. The Romans believed that when someone died, they traveled down to the Underworld. They were buried with a coin to pay the ferryman, Charon, who would take them across the River Styx. After crossing the Styx, they had to get past a three-headed dog called Cerberus, and stand before the Judges of the Dead. How did Romans honor their gods? As well as the main gods, there were also lots of other gods, such as gods of the home and healing. The Romans feared the gods and they would worship them with prayer and offerings in three main ways - at home, in the temples, and at festivals. However, they also made animal sacrifices to the gods and consulted the gods using augurs, individuals who had the ability to read omens. In doing so, The Romans hoped that the gods would give them good luck and protection. Their offerings might include coins, jewelry, statues, and burnt offerings! The panel to the right is a wonderful summary of the numerous ways that Romans honored and worshiped their gods. You can see a temple in the background, a cow being brought for sacrifice (note the person, lower right holding an axe), a bowl in front for burnt offerings, and a musician representing the Roman's love for festivals. Roman temples were just one way to honor the gods. They were usually built for a single god and had a statue of the god at the center. Considered the most important temple in Ancient Rome, the Temple of Jupiter was located on Capitoline Hill. Completed by Emperor Hadrian in 126 CE, the Pantheon was a temple built to honor all the Roman gods. The Romans also built temples to honor Emperors who, after Julius Caesar, were often considered gods and Augustus. 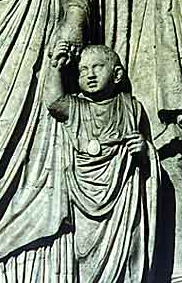 An augur holding a lituus, the curved wand that was a symbol of augury. Lupercalia - Lupercalia was celebrated in February. Like other Spring festivals before and since, Lupercalia celebrated renewal and was a time for planting. ​Consualia - Consulia was a harvest festival celebrated in August. Saturnalia - Saturnalia honored the god Saturn and was celebrated in December. Originally held on a single day, December 17, the festival was so popular it was later extended for a full week. Because Saturnalia included an exchange of gifts, many believe it is the root of the Christmas gift-giving tradition.